I've noticed a distinct air of excited anticipation in Blogland about the onset of a new season. Me? I'm hanging on to what's left of summer with an iron grip. Grim-faced weather forecasters starting their bulletins with "it's all set to change" are either switched off or met with fingers in ears, "laa laa laa, not listening". I love the light and warmth of summer. I love having the doors and windows flung wide open, bringing the outside in. I love the sounds, the colours, the long days and drawn-out alfresco meals. I'm not ready for it all to change just yet. So, I shall continue exposing my not-as-taut-as-they-were limbs in pretty dresses and wearing flip flops for a little while longer! So there!!! Oh yes, I can be a stubborn sod at times. That said, it's pretty much been a week of settling back into the old routine. Blondie Daughter has enjoyed her first full week in Year 7. It's her second year at high school (the children start at the age of 10 here, a year earlier than most) and she and her friends sashay up the path to school with an air of confidence far removed from the wide-eyed terror of a year ago. 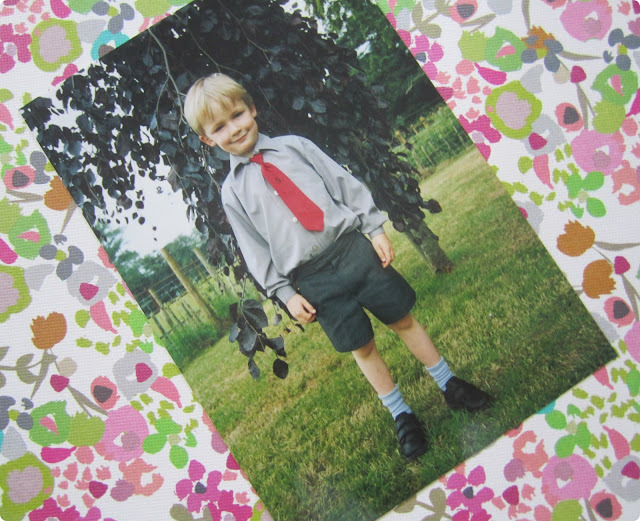 Blondie Son, now in Year 10, has moved up to senior school and embarks on the two year journey to GCSEs. I have to keep pinching myself. Is it really ten whole years since his very first day? He towers above me now and, when we hug, his arms have to go on top. I've been sprucing up the house and garden this week. Doing lots of those little jobs that have been sidetracked for the last six weeks or so. Sassybelle Blooms, I've finally hung up your beautiful string of happy (forgive the less-than-beautiful photo) - it's above the doors in the lounge and, each time I see it, I think of you. I had just the loveliest day on Wednesday. I met up with one of my first bloggy friends, Lynda. 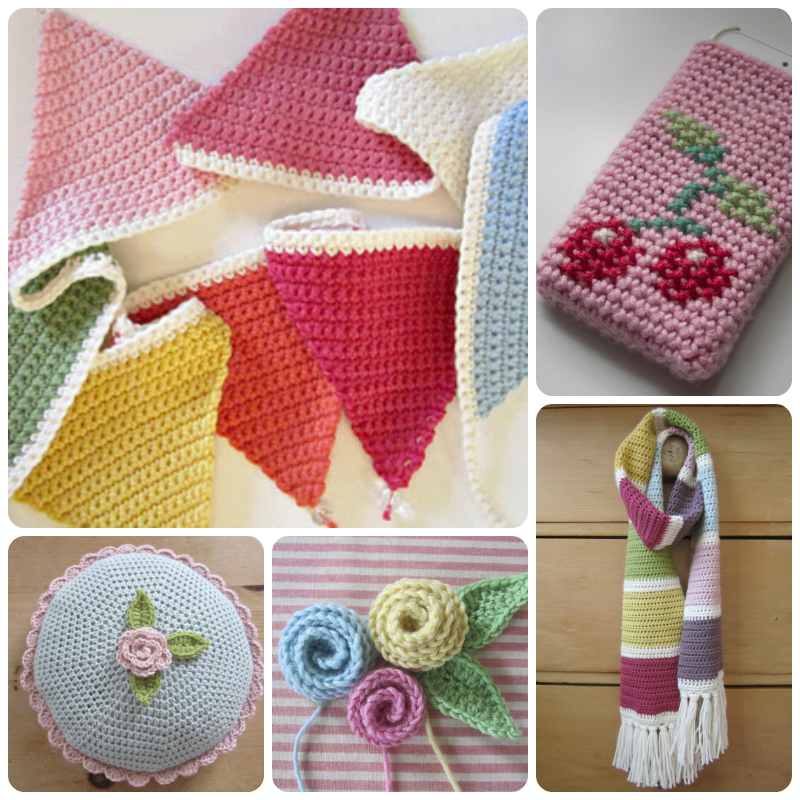 While still being on Instagram, Lynda is taking a break from her blog, Hookin With LaaLaa, and concentrating on her new needlework kit and chart design business. These are two of my favourite designs of hers, aren't they stunning? To the lady who wrote the very disparaging feedback on the CK website about this skirt being more suitable for a 10 year old than a grown woman, I know a certain 11 year old girl who wouldn't be seen dead in it and a 41 year old woman who bloody loves it. Different strokes for different folks eh and thank goodness for that. Before I sign off, are you going to Yarndale? I am! I'm going with two gorgeous online friends (Cuckoo and Emily) who I've known for a while but never met in person (you see how I'm all au fait about this meeting up business now?!) and I'm suuuuper excited! Do come and say "hi" if you see us. 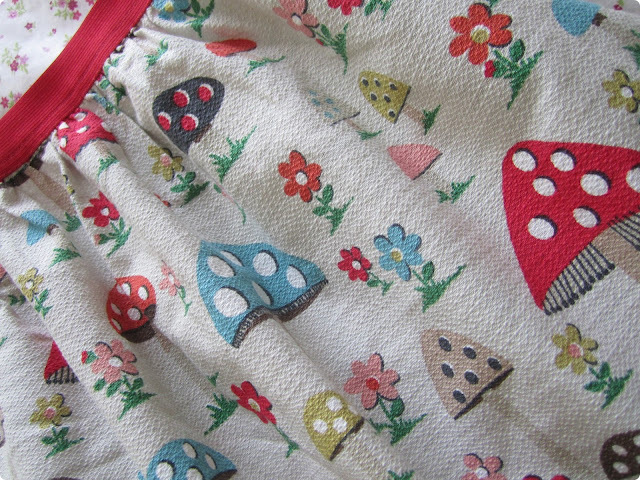 I'll be the one with the mushroom skirt and flip flops!!! PS. 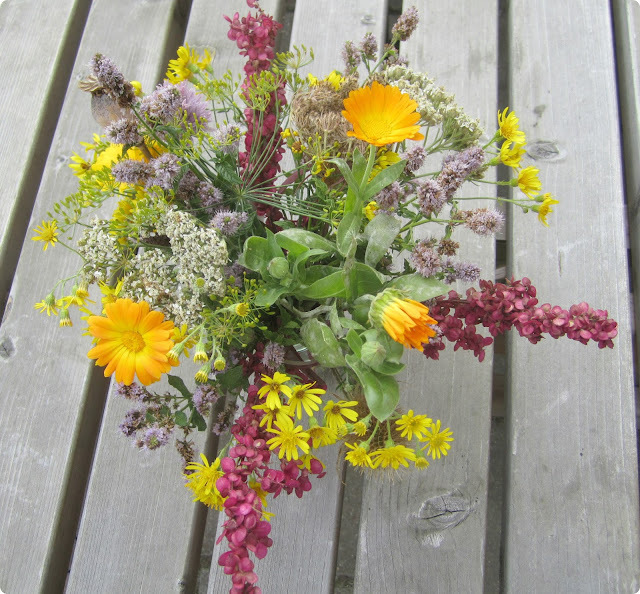 Beautiful wildflower posy at the beginning of this post was from a charity stall at a local fayre. Best £2.00 I've spent in a long time. Seu post está divino! Um lindo domingo para você! I'm going to Yarndale - it's quite a long way for us - so we are making a weekend of it. We will hopefully visit "The Studio" too! So very excited!! Such pretty flowers and I love you new skirt too, have a wonderful time at yarndale. Train ticket booked for my journey to Skipton - actually beyond excited now. I also think all Bloggers should wear badges, I'd love to meet those I chat to and I think I shall just end up walking past them ! As usual - lovely post, and good to link to Cuckoo and find a new post there. LOVE the skirt - will look out for it at Yarndale! Adorable Skirt Heather, and the little bouquet of flowers is so sweet. 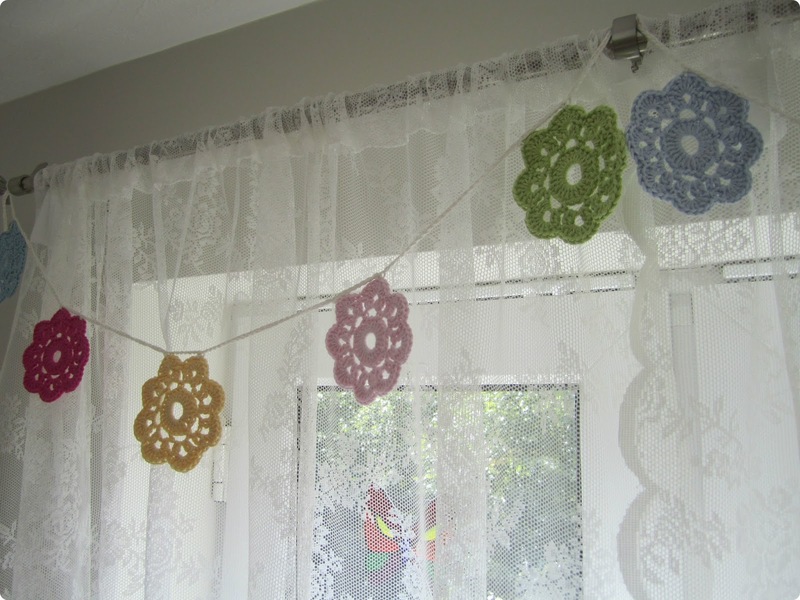 The needlework designs are beautiful and that garland looks so pretty hanging over your lace curtains! Have lots of fun at Yarndale. Oh...and take lots of pictures! That garland is so pretty. Very summery. what a lovely thing to get to look at every day. Enjoy Yarndale, those things are always too far for me to go to. But I shall look forward to seeing what everyone posts on their blogs about it though. Gahhhhhhhh! I dunno what to wear! Everyone thinks I look like that flaming Fat Face girl now thanks to you! Lynda IG'd it and people have agreed and now I'm scared to show me face because I look old and haggard in real life and everyone will be disappointed....fretting!!!! Love that skirt. I tried it on and I look like a barrel in it. You look cute as a button. Seriously cute. I got me bag! I'm chuffed. You are lush, you are. I was going to make us all one but now I needn't, I didn't know you could get an official one. What a poppet you are. Thank you. Oh boy you could wear that cute skirt over here in California, all the way to the end of October. Have fun at Yarndale! If I met someone wearing that perfect skirt, I would follow them round for days asking them to please, please be my friend so I could have some of the reflected glory of the skirt when we walked together in public. Or I would steal it from their washing-line. One or the other. 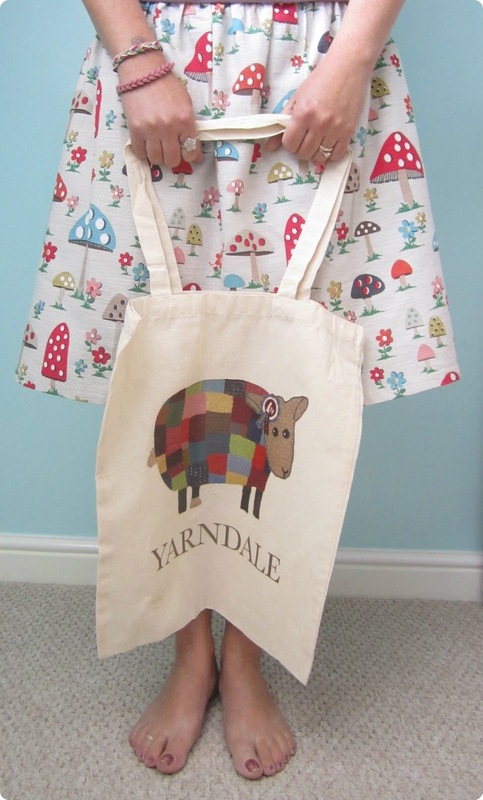 Hi There,I looooove your mushroom skirt and Yarndale bag!!! !I also love it when bloggy friends meet up in person!! !Have a great week!!! Yay! It was great, wasn't it. I can't wait for next time so get thinking of what we're going to do in Leicester. Yes, D, it was all my fault. Mine and mine alone. I practically tore the money from Heather's purse. The skirt looks great in you! It was made for you. Thanks for the links petal. You're precious, you are! I completely with you, having onto the Summer and enjoying every last drop of it while I can. So glad you had a lovely bloggy meet up, amazing how nerve wracking they are isn't it? Glad you enjoyed it though. PS Here's to fully grown women in mushroom skirts! I love it too, I saw it in CK the other day and only didn't get it because I was spent out already! Yarndale sounds like a great day out but it is too far from here so I hope you take loads of pics and show us what it is all about. I hope you have a great day and meet some lovely people. I'm wondering much the same Pati! I've relented and put a cardi on today, gah!!! Gorgeous flowers and crochet Heather and your skirt is so pretty! (I also love the Garden Birds design)..I'd definitely be looking out for you in your mushroom skirt if I were going to Yarndale...Hopefully, I'll be there next year...it's going to be brilliant and I'm looking forward to seeing all the pics! 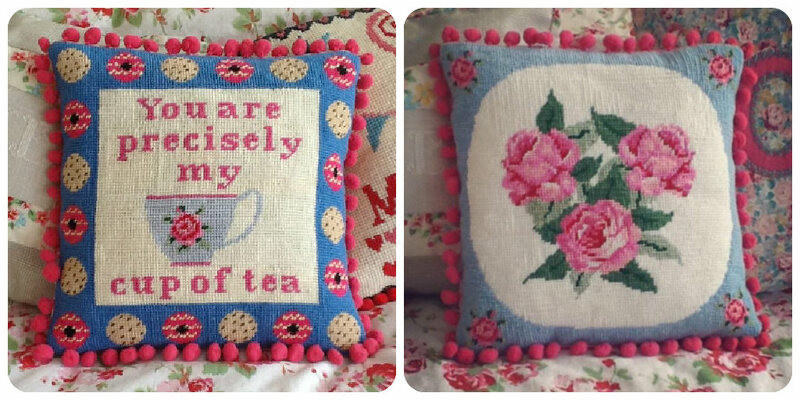 Lynda's designs are beautiful...she's so clever with her stitching and her new website looks lovely. It's so cold here today but I did say I love autumn so shouldn't start complaining! I'm so with you on eeking out every last smidgeon of summer....but today feels like winter has arrived....I've had to resort to wearing jeans, vest, t-shirt, cs cashmere cardigan....and socks!!!! And I'm definitely not happy about it, I have to say. I'm so delighted you like your garland and brooch.....I have my mini milk bottles sitting in the middle of the dining table dressed with red scabious flowers.....see, trying to hold onto summer for just a wee bit longer. It's so nice you met up with Lynda.....I'm hoping to meet with her in a week or two.....and I look forward to meeting up with you to.....maybe we....you, me and Lynda....could all meet up together....what do you think? I think they should introduce a new rule for Yarndale ... all bloggers to wear blog name badges ... imagine how many people we might meet that way! 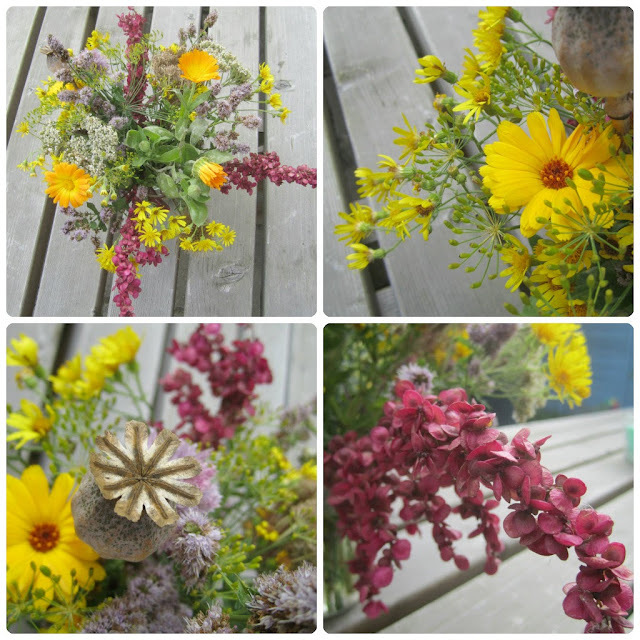 Hello Heather - what a lovely blog you have here, I'm looking forward to browsing some more very soon and, in the meantime, thanks so much for visiting my place - I've left you a reply there! By the way, I love your sweet fresh skirt - enjoy showing it around at Yarndale! 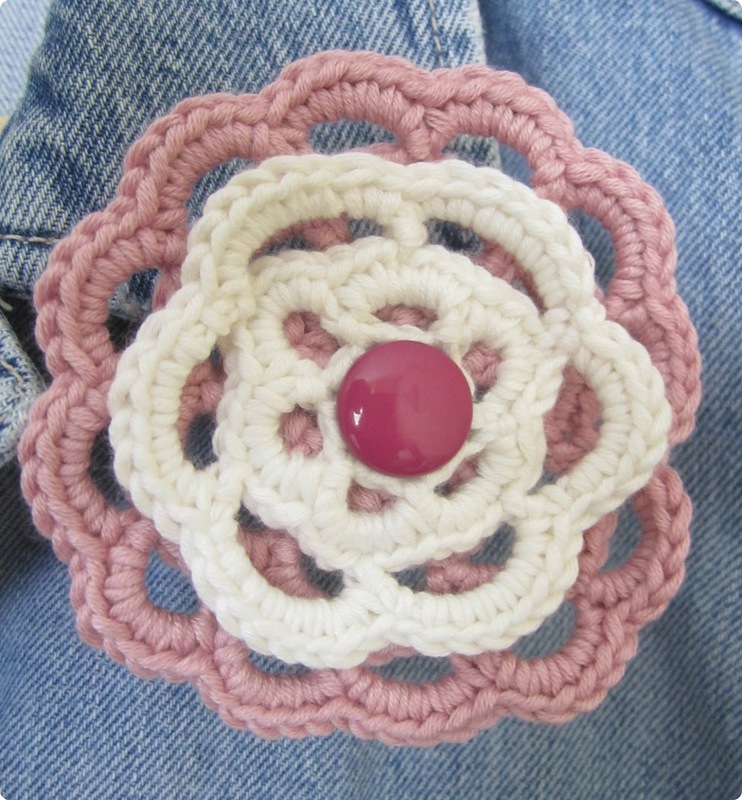 Love your little flower posy, very pretty. Also your new skirt...it's gorgeous! Hope you have a great time at Yarndale. Oh I so wish I was going to Yarndale...just know it will be a huge success! have a lovely time and do say hello to my lovely friend Ms Laa Laa...she'll know who I am!